After all the bundles have been created in TouchPoint, you are ready to post the contributions to the records of the contributors. If you are using a check scanner your process will be different than what is described below. In Step 2 below, you can use the following methods to Find the Donor when posting contributions. Some churches use mailed envelope sets that have the person’s People ID# printed on them. This makes posting by the ID# very simple when you use the envelopes for posting. 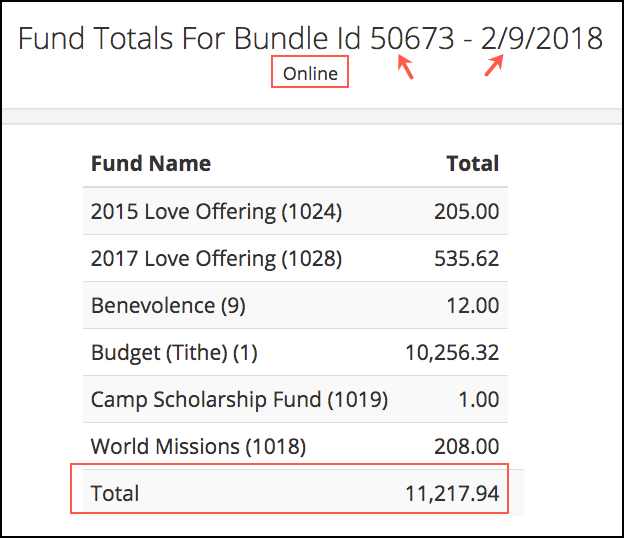 If your church has the old envelope number from your previous church management system in Extra Value fields, you will want to read about how to use those numbers to post contributions. AltName See below for more about searching using the AltName with Chinese characters. As you type, a drop down list will appear, displaying the name, age, and street address. If the name you want is at the top of the list, just hit tab . If it is farther down the list, use the down arrow or mouse to select the name. You can check the box Display more information , in order to display the following additional information: email address, 4 most recent contributions, and, if the donor has a spouse and receives Joint Statements, you will see the name of the spouse - ex. [Giving with: Juliann Bauder]. The default for the Contribution Type is CN (Tax-Deductible) for all bundles that are not Pledges, Gift in Kind, or Stock. Example: Pre-Printed Envelopes and Loose Cash / Checks. If you are posting other types of contributions, select the appropriate Type from the drop-down menu for Type after you enter the Amount . Once you change the Contribution Type while posting, that type will remain for the next contribution. Be sure to change it back, to CN if necessary. CN only displays while on the row to enter a specific contribution. However, all the other types will display on Post Bundle / Edit so you will notice if you have anything other than Tax Deductible selected. We recommend that you do not mix contributions and pledges in the same bundle. This report will give you a breakdown by Fund within the bundle, with the Bundle total at the end. The header will include the Bundle ID#, Date Posted, and the Bundle Type. This report is used to verify that the totals for each Fund within the Bundle are correct based on the initial counting of the Bundle. You generate this after you finish posting contributions to a Bundle, by clicking on the Default Fund link in the Bundle Header. You can also use this if you want to post to your GL by bundle instead of by a date range. See the help article listed below for more about using AltNames. There are a couple of Settings that are required if you want to display the AltName and if you want to be able to search by a characters inside a Chinese name. These steps are done after the bundles have been created and given a total. Go to Administration > Contributions > Bundles , then click open in the Status column for the bundle you want to edit. This will open the Post Bundle / Edit page for that bundle. If you click the ID # of the bundle from the list, it will open the bundle details. From there, select Action > Post Bundle / Edit . Enter the People ID # in the PeopleID field or use the Name field to search as indicated above. Tab to the Amount field, verifying that the correct name has populated the Name field. Enter the dollar amount of the contribution in the Amount field. See explanation above for Contribution Type . If you need to select a Fund that is not the default, just select it from the dropdown and tab to the next field. Tab through the remainder of the fields, entering a Check # or Notes (optional). The last tab will be the Update button. Once you tab past it, your cursor will be on the next line. Continue as above until all individual contributions have been entered. Once you have associated a contribution with a person, their name becomes a link to their people record. This will open in a new tab, making it convenient for you to make updates and then return to the original tab to continue posting contributions. Click the Back to Bundle Details button, and then click the Default Fund link in the Bundle Header to run the Fund Total Report . See above for sample report. Some contributions will be for more than one Fund. It is very easy to split the contribution into multiple Funds as you proceed posting the contributions. If the name you entered is not in the database, nothing will appear in the drop down. When you Tab, a Name Not Found message will appear, and the text you entered will be removed. In those cases, follow the steps below. Entering the Amount and the rest of the information, tabbing through Update . Your cursor should then be on the next line. Click the Select link in the PeopleID field for the contribution you just entered. This will allow you to search again using the normal Search/Add process to find the person or add a new person. After finding the person or creating a new people record, once you click Commit and Add , the contribution will be posted to that person’s record. If you prefer, you can type the person’s name in the Notes field, flag the check or envelope and return later to search for the person again or add a new record, if needed. Just return to Post Bundle / Edit for that bundle, and click the Select link and proceed as described above. We recommend closing bundles at the end of each week. Go to the Bundle List (Administration > Contributions > Bundles) and click on the Bundle ID# for the bundle you want to close. Select Actions > Edit Bundle Header and change Bundle Status from open to closed. You will not be able to close the bundle until the Bundle Header Total matches the Total Items and all contributions have been assigned to a person. You can leave the Post Bundle / Edit page and return later to finish. Also, if you have any contributions that are not assigned to an individual, you can leave Post Bundle / Edit and return to assign the contributor. If you would like a report that separates cash and check contributions and provides a sub-total of each along with the details (individuals donors), you can add this Bundle Report by using our Python Recipe. You will copy and paste the code into a new Python script and the link for the report will display on the bundle page. This is suitable for smaller churches with one or two bundles per day. At some point after bundles have been closed, you will need to enter the summary totals into your general ledger. You find those totals separated by fund in the Totals by Fund report. You can do this weekly or monthly. If you enter these into the GL on a monthly basis, you do not want to wait that long to close your bundles. Normally you do that at the end of the week. There may be times when a contribution should be moved to a different bundle. Here’s how you can do that. Both bundles must still be open. From the Bundles list, click on the Status to access Post Bundle / Edit , and find the contribution that needs to be moved. Click the Actions > Edit on the far right of the row for that specific contribution. This will cause the gear icon to appear. Now select Move to another Bundle . Enter the Bundle ID # for the correct Bundle and then click Move . A Success message will appear briefly to let you know it was moved. Adjust the Bundle Header Totals for both Bundles to reflect the change. This will be very rare, but you might need to change the contribution date for an individual contribution within a bundle. Here’s how you can do that. The bundle must be open. Go to Post Bundle / Edit for the bundle containing the contribution, and click Action > Edit for the specific contribution. Click the calendar icon , select the correct date, and click Done . Click the Update button to finalize the change. The Notes and Check #’s do not print on statements by default. However, your TouchPoint System Admin can add one or both of the following settings if your church wants these to display on giving statements: RequireCheckNoOnStatement and RequireNotesOnStatement and set the value to true . Also, by default the Printed Date displays on the statement. If you do not want that to print, add the Setting NoPrintDateOnStatement = true .